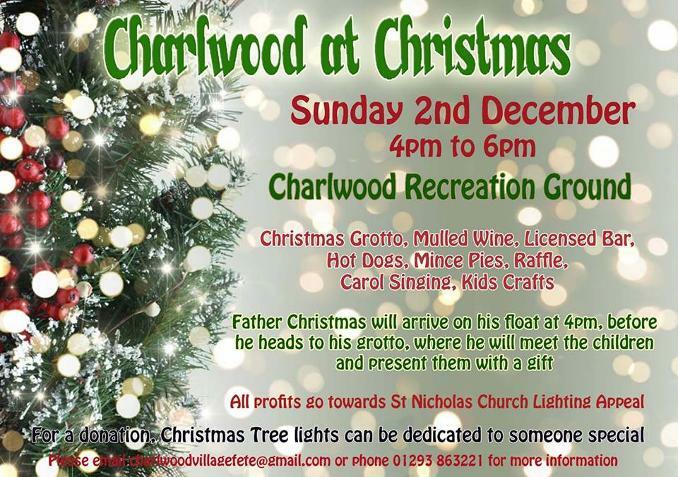 For a twinkling event set to herald the start of Christmas, on Sunday 2ndDecember, the Recreation Ground will be the setting for a magical winter spectacular as Charlwood at Christmas gets underway. Father Christmas will arrive on his magical float complete with reindeer, glittering lights and snow, before heading to his grotto where, if you’ve been good girls and boys, he will give you a present. Mums and Dads, Grandma’s and Granddad’s can enjoy a glass of Mulled Wine or a beer as the children get to visit Father Christmas and convey their Christmas wishes. Along with a raffle, mince pies, hot dogs and licensed bar, there will be something for everyone. Carol Singing gets underway at around 5pm and we all enjoy those well-loved Christmas tunes led by our own village choir. Young and old alike are in for a treat as at 5.30pm we congregate in front of the Sports & Community Centre as thegleaming, glimmering lights on our Christmas Tree get switched on as if by magic by Father Christmas and a special helper. All the lights on the tree are sponsored and can be dedicated to someone special for a suggested donation of at least £5 per bulb; this is a lovely way to remember loved ones. The evening comes to an end as the raffle is drawn, before heading home, happy and excited and in the Christmas spirit. 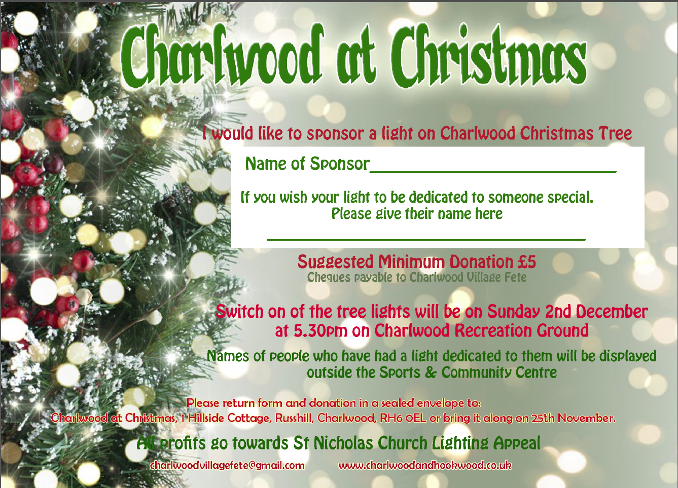 For more information, please check the community website www.charlwoodandhookwood.co.uk or email charlwoodvillagefete@gmail.com.